Swansea City striker Adebayo Akinfenwa has played his last game this season after breaking his leg in Tuesday's home 2-0 defeat to Scunthorpe United. The 24-year-old was strechered off before half-time after a heavy fall and has been ruled out for six months. The match could prove to be Akinfenwa's last for Swansea as the burly striker, who has scored just six goals this season, is out of contract in June. "We are all gutted for Bayo," said Swans caretaker manager Kevin Nugent. "He got off his sick bed with flu to play and he's suffered a serious injury for his trouble. He will be a big loss." Akinfenwa's injury leaves Swansea with just Lee Trundle and January signing Pawel Abbott as their only senior strikers. Leon Knight and Rory Fallon, who had scored 15 goals between them, were allowed to leave the club earlier this season. 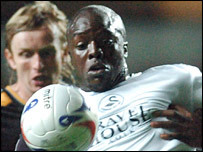 Swansea suffered further woe against Scunthorpe with injuries to Izzy Iriekpen, Richard Duffy and Darren Pratley. Defenders Iriekpen (hamstring) and Duffy (bruised foot) are unlikely to play in Saturday's trip to Yeovil, and there are doubts over Pratley after he dislocated his shoulder. "The shoulder popped back in itself and Darren was able to continue," said Swansea physio Richie Evans. "We will be investigating the injury in more depth on Wednesday."